Many companies talk about culture. At JW Aluminum, the principles of our WIN culture drive everything we do. We attribute much of our longevity, stability and success to the culture we work every day to cultivate. And because we are led by and committed to our cultural values, we bring value to the marketplace. We invite you to experience our culture for yourself. The doors to our facilities are always open to all our customers and prospective customers - just let us know when you'd like to visit, come by, talk with our team and see how together, we all WIN. The WIN philosophy is based on the principles of organizational change. In today's business environment, change is constant, so it's ingrained in our culture to provide our team with the skills they need to thrive in the midst of change. 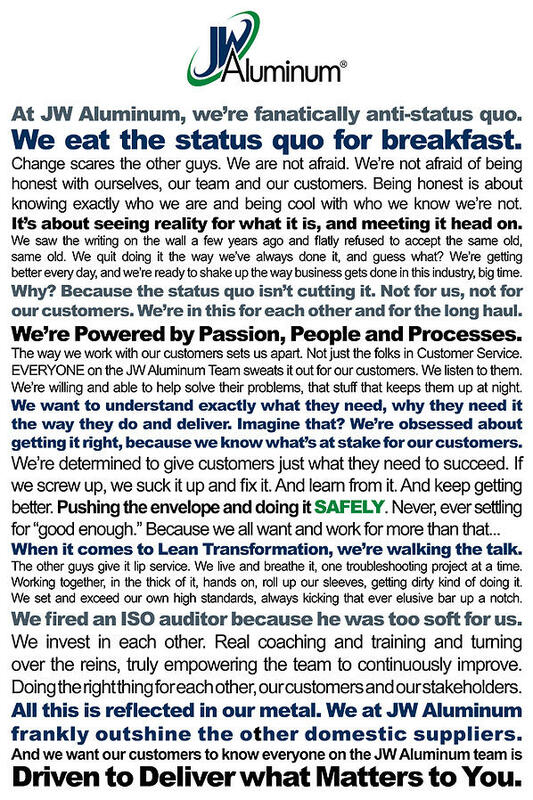 We strive to create a culture of ownership within every department through every step of our processes. That sense of ownership drives every JW Aluminum teammate to put our customers first, take pride in the product we provide to our customers and service customers the way they deserve. We are passionate about the people we hire and the processes we implement, because we know that only the best people and strict adherence to the most effective and efficient processes create the type of product we're proud to put out into the marketplace. We make significant investments in developing our people and refining our processes because we know that these investments will be directly reflected in the products and services we deliver to our customers. In a dynamic and competitive marketplace, we recognize that simply talking about operating at our very best isn't enough. The JW Aluminum team recognizes that attention to each and every action is the only way we can continuously improve and deliver real value to the marketplace.